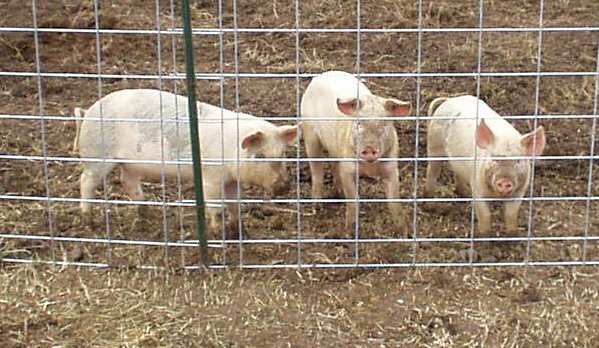 Salatin refers to these as "pigaerators". The pigs turn the commpost for you while rooting for goodies in the pile. I've read Salatin's books and checked around on the internet where several folks have reported success with this technique. These pics are from my feeble attempt. Here I'm laying down a bunch of corn and barley and covering that with straw. The chickens are helping. You can see my manure piles on the sides. 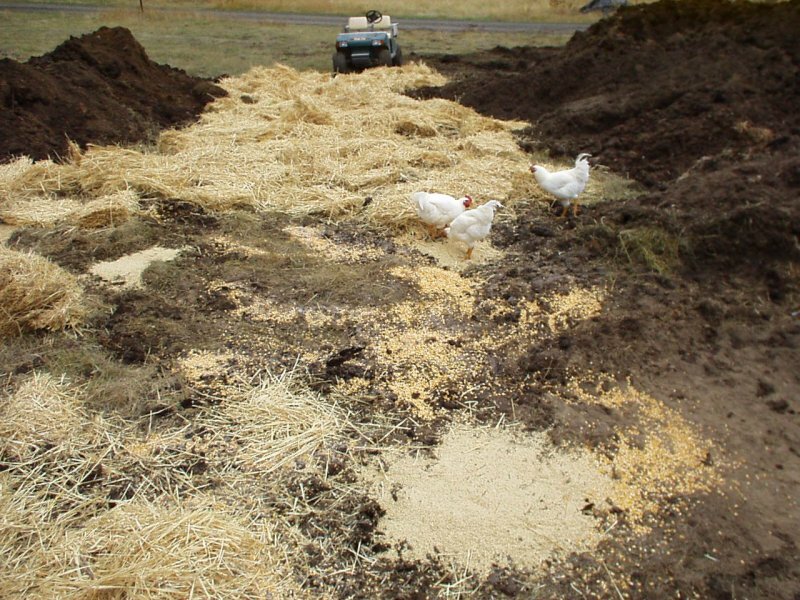 After laying down all the straw, I cover the straw with a foot or two of manure and lay down more straw. This time I wet it all thoroughly. Here you see David and some chickens helping out. Some stock panels around the pile (giving plenty of room for the pile to spread out over time). Note the wooden barrier - this allows us to get in and out, but keeps the pigs in. 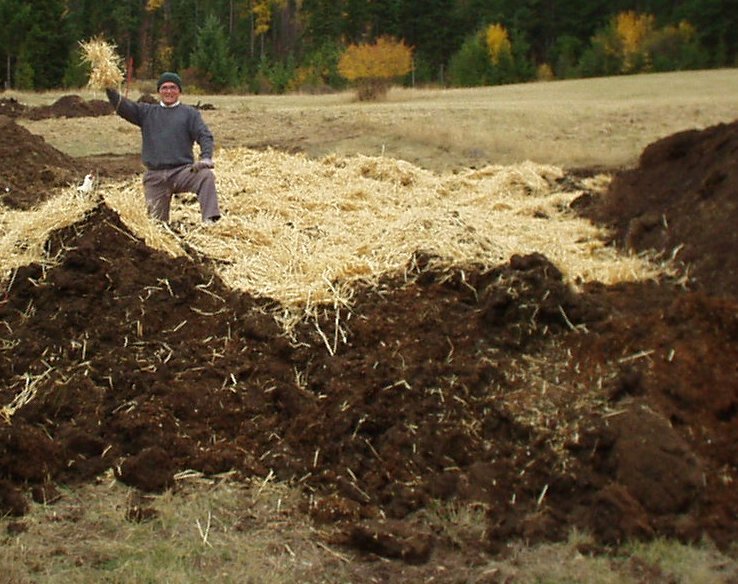 You can see that after mounding up the rest of the manure, we put a layer of straw on top. We then wet all the straw thoroughly. You can see a section to the left where the pigs have already done a fair amount of turning the compost. The pigs play on the pile all day long. Sometimes the sleep on top of the pile instead of in their doghouse. This picture was taken in November of 2001. I hope to update this page in the Spring of 2002 with how this worked out. 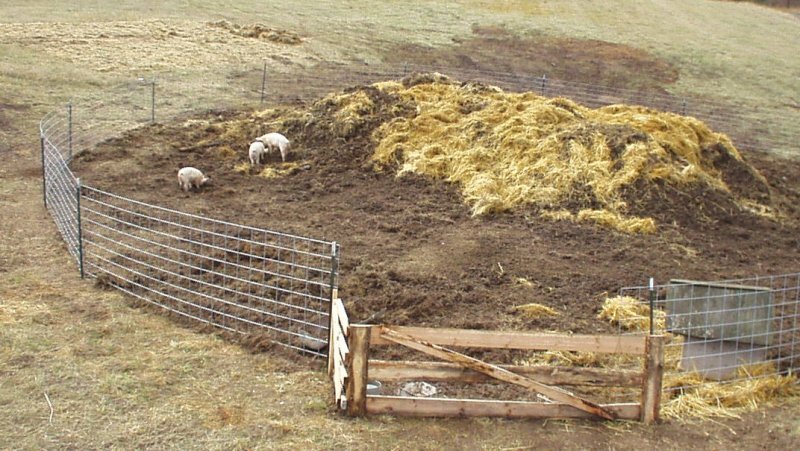 Several people on the internet have talked about the value of using pigs to prepare land for agriculture. Rumor is that you don't want to pasture pigs because while it may be good for the pigs, it's horrible for the pasture. Some folks found the silver lining in this by using the pigs to help clear troublesome areas. 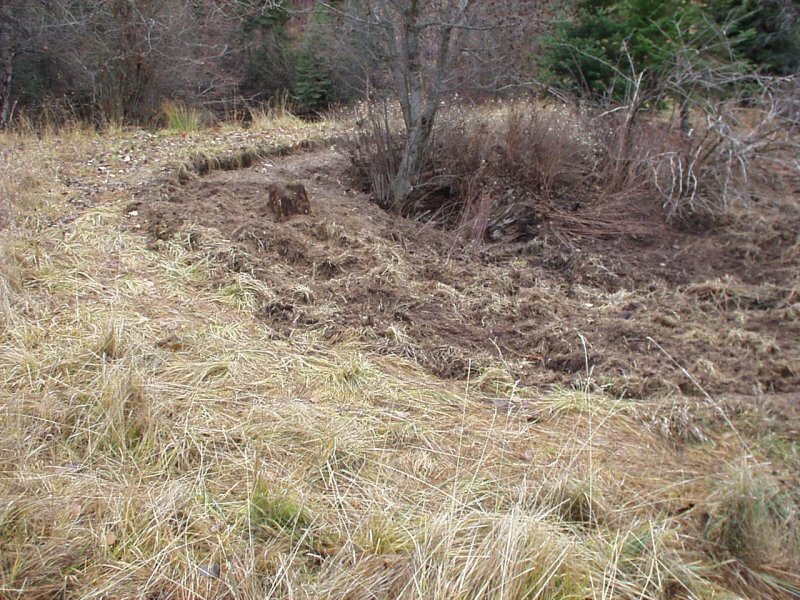 In this case, we had a pond dam that was covered in brush and trees. The word is that this is a bad thing. The roots of the trees and large bushes will find their way to the pond. A trickle of water will start to dribble along the root. That dribble will get bigger and bigger until one day you will find your dam completely washed out. Our mission is to clear away this brush and trees. The thick brush is making it difficult to get to the trees and the slope is making it tough to get the bush hog in there. After about six weeks in this pen, the pigs have done some serious rooting action. Everything that is destroyed is where the pigs rooted - sometimes more than a foot deep! All of the thistles were totally destroyed. 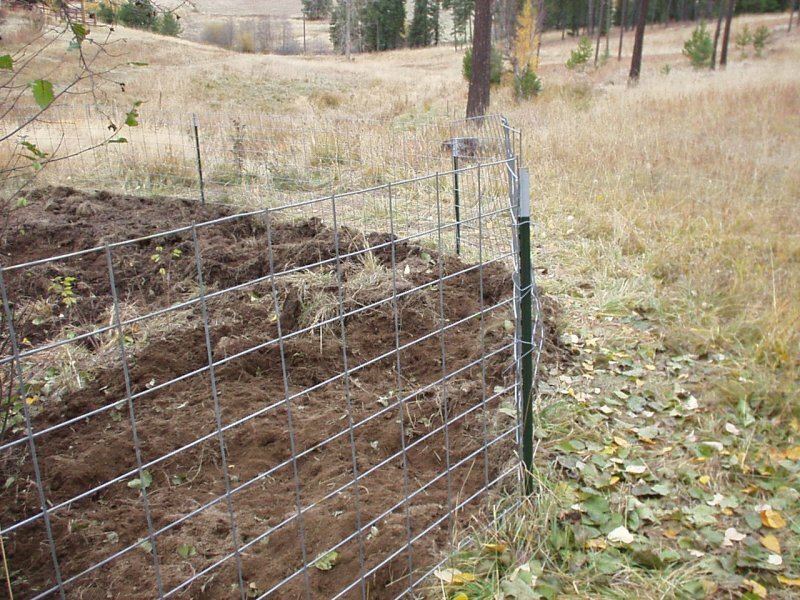 Now we took the fence our and it is clear where the pig fence was. Most of the bushes are now gone, but it looks like they did not like the snowberry bushes. The important thing is that we can now get to those trees with a chainsaw! You can't really see it in this picture, but the pond is off to the left. The pigs also uncovered a bunch of garbage left by the previous land owner and a bunch of deadwood - we didn't even know that stuff was there! These are our party pigs. They always seem to have a good time running, playing and rooting. Paula, Edna and Marge. One of these is destined to the freezer. Soon we hope to get a fella for the remaining two. Another thing I have read about is using pigs to seal a pond. We have a pond that has a fair amount of water running in it, but it never gets full. I plan to fully drain the pond, divert the water, put a fence around the pond and run pigs in there for a month or two. The theory is that shape of a pigs hoof packs the soil so tight that water cannot penetrate (another reason to not have pasture pigs: apparently the water on the pasture will start to run off instead of soak in). So when we take the pigs out, the pond should be completely sealed and fill properly. Using this same idea... we have a couple of creeks that seem to dry up in patches. It is clearly running undergound. I would like to bring this water to the surface. It seems that the wisest thing to do would be to run pigs in the creek during the time that the creek is dry (or near dry). More news as events warrant! If you like this article, please link to me. Click on one (or many) of the social network links below. Linking to this article from a forum is nice. Or even better, mention this article in a blog!